These are for AC. For DC you just need to match the voltage, which is a function of RPM as well as the field current. 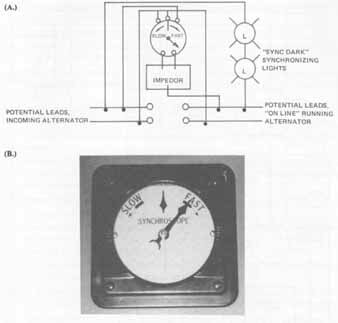 I don't know exactly what type of dynamo was used by Edison, and I could not find any reference to the problem of synchronizing them for parallel operation for his demonstration. The arcs and sparks and smoke, as well as the all-night effort to rebuild them to meet the deadline, were probably Hollywood drama. I am familiar with AC sync scope. But you don't need a sync scope to parallel a generator, as two light bulbs connected between generators will do. You don't need to sync a DC generator to get it on line together, the voltage and engine speed have to be controlled in order to load share properly. On a DC generator more so the voltage. A shunt generator you have to control the voltage in order to load share, on a compound Generator an equalizer jumper parallels the series field which makes it load share very well, because the load goes through each generators series field. PStechPaul There are no modifications to the armature. The motor I used for this generator came from a heater/airconditioner fan. The magnets were part of the original motor. To those who have little understanding of why there are problems running generators in parallel, think of two electric motors connected together that run at two different speeds. Very soon the motors will overheat and flame, smoke will surely happen.